Ilex aquifolium silver queen growing shrub or tree of the genus Ilex also known as Common holly, Ilex aquifolium silver queen perennial evergreen used as ornamental hedge plant, can grow in temperate, cold mediterranean or cold subtropics climate or as houseplant and growing in hardiness zone 3-8. 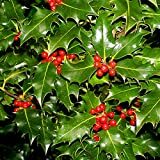 Leaves color variegate green with white or yellow in oval or shapeless with spines in the margin of the leaves. Flower color white in female tree and yellow with green in male plants, the flowers grow in clusters. Fruit not edible in red color the fruit glossy in 0.5cm. 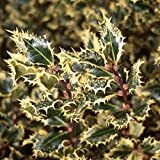 20 Marnuki english holly seeds - Ilex aquifolium " Marnuki "
Ilex aquifolium " Pyramidalis "